→Dewalt DWX723 Review – The right heavy duty miter saw stand for you? 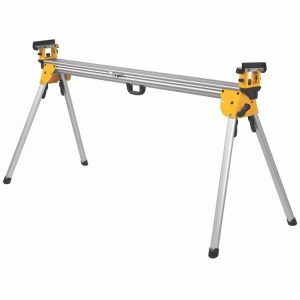 The Dewalt DWX723 heavy duty miter stand is and affordable product and it is suitable for use with all types of miter saws. 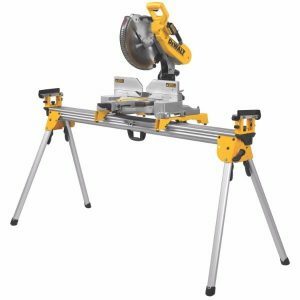 Is the Dewalt DWX723 heavy duty miter saw stand for you? I like the fact that the Dewalt DWX723 heavy duty miter stand is light enough to easily cart around (only 35 pounds) yet robust enough to cope with up to five hundred pounds of material. It features folding legs that makes it very easy to stow and to store. Another neat feature is that the feet of the tool mount is made of non-marring material. This means that this miter saw table will not cause scratches on any material. Not only is the DWX 723 heavy duty miter stand suitable for use with all types of miter saws, but it offers useful features that makes it suitable for use in almost any working environment. The brackets will also work with any miter saw and, what is more, the extension lock levers will provide an additional 50 inches of length. This is more than adequate for steady locking of the supporting extensions. I liked the fact that the brackets have a quick release feature. This lets you place the saw at any point along the rail. You can even have two saws on the stand at the same time. What’s more, the material supports can be adjusted to wherever it is needed on the rail. They can even be adjusted upwards or downwards, thereby increasing the possibilities of the materials that can be cut. Your Dewalt DWX 723 heavy duty miter stand complies with very exact manufacturing standards. It should last you for years. The entire range of Dewalt tools and accessories have, over the years, established themselves as reliable and durable. Dewalt provides a warranty for all their products. In this case a three year limited warranty is supplied with the product. One Dewalt DWX723 miter saw stand. Two convertible work supports / stops. Even though Dewalt says that the DWX 723 can be used with all types of miter saws, there may be a problem with the location of the mounting holes in some saws. This is not an insurmountable problem, however. It is easily solved by making a three quarter inch plywood base. You then mount your brackets underneath and your miter saw on top of the base. Some users are finding it difficult to attach the saw to the stand. They complain that they have to keep positioning and repositioning the saw before succeeding. It seems that the design of the attachment brackets is to blame for this particular difficulty. Amazon is reliable. They keep to their delivery schedules and they back the products that they sell. Payment on Amazon.com is secure. It is really easy to initiate and finalize the transaction and they make sure that you are kept in the loop until the product is delivered to you. In most cases they can even have the product on your doorstep within a day! Most products are thoroughly reviewed. This allows me to see what other people though of the product and this often helps me to make a final decision regarding the specific model I end up purchasing. If you need a stand that can be collapsed, stowed and transported easily then the Dewalt DWX723 is definitely for you. It is definitely for you if you want to use various brands of miter saws on the same stand or if you want to use two saws on one stand at the same time. The DWX723 is also for you if you want to place a saw at any point along the rail quickly and effortlessly. If you regularly work with heavy loads of up to 500 pounds then this Dewalt product will certainly fulfil your requirements, especially if you want tighten extensions quickly and securely.